Being a youth in today’s world is tough. But everyone has the power to choose between right and wrong. The friends we decide to surround ourselves with will influence the choices we make! 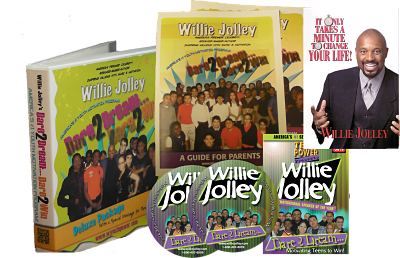 In this Dare 2 Dream, Dare 2 Win DVD, Dr. Willie Jolley shares an inspirational story about the benefits of being a leader and making decisions that will affect your future. You can become the positive influence in your group of friends - even when you see them going in the wrong direction! Read this true story and learn lessons that will save you from making poor choices. "I conducted an mentoring session today at the Boys and Girls Club Youngstown, utilizing the Willie Jolley’s Dare 2 Dream DVD. At first the teens didn’t want any part of it. I put a piece of paper and pencil in front each of them for taking notes. Five minutes into the DVD the kids were sitting up straight and following along. By the end of the DVD everyone had a full page of notes. I asked the kids, just like Willie did at the beginning of the DVD.. What grade did he earn? A or F, everyone said it was an A. The Boys and Girls Club Youngstown Teens now know that they too can Dream BIG! I purchased Dare 2 Dream Dare 2 Win from your fabulous “Monday School” a few weeks ago at the Sanctuary. I let my nine year old son, Chase, look at it by himself and then we watched it together the second time. Chase has been turning the DVD on to watch it himself when we arrive home in the evenings. He stated that he wants to be successful like Mr. Willie Jolley. Also, he is walking throughout the house mimicking YOU, saying ”I’m Awake – Ready to Shake & Bake” and singing your jingles, etc!!! This DVD is powerful and I recommend it to all our youth nationwide! It was amazing to hear my son shouting your comments and affirmations around the house. An absolute JOY for a parent to witness…. Is your child "bummed out" about going back to school? Has their "get up and go" gone? They need to get an attitude of excellence that can carry them successfully thru the school year! Changing their inputs will change their outputs. Get the Dare 2 Dream, Dare 2 Win Youth Motivation Deluxe Package. The Dare 2 Dream Dare 2 Win DVD. An Audio version to play in the car while driving with your child and their friends. A Specially Designed Parent Guide with helpful ideas on how to review the key points presented in the video: drug & alcohol prevention, making wise choices, scholastic excellence reinforcing the concept of “readers are leaders." A Specially Designed Student Guide which reviews all the key concepts in the DVD with additional inspiration and motivation to continue the move in a positive direction with school, home and life in general! Dr. Jolley’s book, It Only Takes A Minute To Change Your Life, which is considered to be one of the top books for helping people develop a positive mindset. It is used in many schools and colleges as a positive thinking textbook. America's #1 Motivational Youth DVD! Copyright © 2019 Willie Jolley Worldwide. All Rights Reserved.